Ryobi introduces their new cordless tool to the plumbing market, the Ryobi P4002 18V One+ Hybrid Drain Auger. As the name might suggest, the Hybrid Drain Auger can unclog your pipes through power supplied by either 18V Ryobi battery packs or corded electricity. The Ryobi P4002 will retail for around $149 from Home Depot. It becomes available in October 2017. The Ryobi P4002 comes with an AC power adapter so that you can run off AC current if needed. It’s part of the Ryobi One+ line though, so if cords are out of the question, any Ryobi 18V battery will power it. The drain auger includes a 25 ft reinforced cable to avoid kinking. It can tackle pipes 2″ or less, which ought to cover all your basic home clogs and help you avoid calling a plumber for the basics. This model comes with a set of interchangeable tips for all sorts of clogs and the chuck design allows for quick retraction of the auger cable when its time to pack it all up. A drain port in the rear of the drum keeps water from building up while feet have been mounted to the unit to keep the rotating drum from scratching tabletops and other delicate surfaces. The Ryobi P4002 comes with a 3-Year warranty and will be available at your local Home Depot for $149. Editor’s Note – the unit only comes with one small bulb tip. 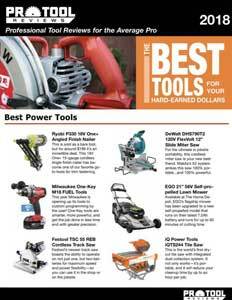 While the manual states that other tips are available through Ryobi’s website, that currently is not the case. Until other tips are available, you can get a replacement cable of the same length and diameter with interchangeable or integrated tips. One of the coolest things about the Ryobi P4002 is the capability to run off either corded electricity or 18V Ryobi batteries. Obviously, battery power is more portable, but there probably won’t be too many opportunities to use this drain auger where there isn’t an outlet nearby. If you find yourself short on batteries, or just have them powering other tools, it’s nice to have the option to go corded.